By contributing writer Ameena Naqvi for KidSpirit's Myth and Magic issue. The waves crashed softly against the boat, pushing it towards the shore. My grandfather stepped off the boat and tied the rope to the dock. That day my grandfather was going to teach me how to sail. He described sailing as flying over water. It was like freedom to him, to set sail into the wide blue sea and leave his responsibilities on shore. However, I did not see the appeal of sailing as he did. The whole activity made me feel uncomfortable and vulnerable, as I was at the mercy of the waves and unpredictable weather. With a deep breath I stepped onto the boat and began to drift in the unpredictable tide with my grandfather. As we got farther away from land I began to feel nervous. Suddenly the boat jerked forward with the force of the water, and I was pushed against the mast, tilting the boat to one side. This took both my grandfather and me by surprise, and we almost fell into the churning sea. When the boat finally regained its balance, I was taken aback by my grandfather's laugh. I felt my face turning red hot with embarrassment. With a chuckle he offered me the tiller. Looking at him with disbelief, I downright refused. I said plainly through gritted teeth, "I will not make a fool out of myself! I have no love for sailing!" Expecting a scolding, I was surprised when all he did was slacken the mainsheet to slow the sailboat. He gestured me towards a seat next to him and asked, "Have I ever told you the story about Prophet Yunus?" 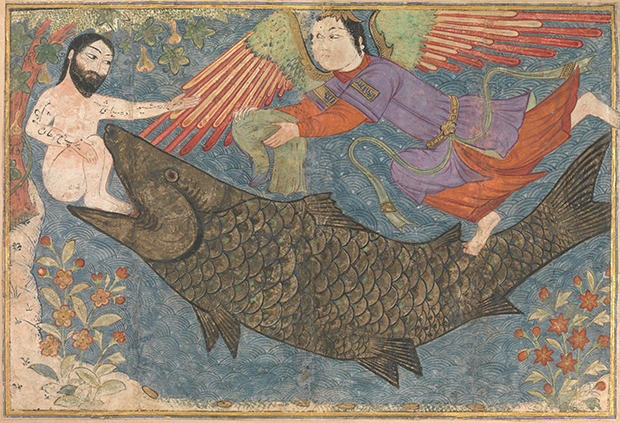 He recounted the Islamic story of Prophet Yunus (also referred to as Jonah). Prophet Yunus was sent to teach the inhabitants of a town called Nineveh about the message of Islam. However, the people in Nineveh rejected his message and persisted in their wrongdoing. The prophet got so frustrated that he left on his ship in anger. In his absence, the villagers sought Allah's (God's) forgiveness and were spared from punishment. Meanwhile, a terrible storm occurred while Prophet Yunus was sailing, throwing him into the sea. A whale came to the surface and swallowed Prophet Yunus, shutting its teeth like white bolts in a prison cell. This was a punishment from Allah, because instead of being persistent he had abandoned his mission and left Nineveh. Once he had realized his mistake, he prayed, and Allah gave him another chance. Here my grandfather concluded by saying, "Whenever you feel like giving up, remember the story of the Prophet Yunus." Those words were inspiring to me. It was then that I realized the power of resilience and persistence. I was so moved by the story that I stood up and tried holding the mast again. It was the summer of 2013, and the television lit up with horrific scenes beneath the headline "Alberta Floods." Waves smashed down and destroyed people's homes and belongings as families watched helplessly. When this terrible disaster struck my hometown of Calgary, Canada, I tried to ignore it, thinking that rescue workers would take care of it. I attempted to satisfy my conscience with the delusion that there was nothing that I could do about the tragedy. This thought was completely wiped away when I found out that my close friend, Shelly, had lost everything because of the flood. I was reminded of the story of Prophet Yunus. Just like him, I had abandoned my community by thinking that there was nothing I could do. Like him, I also got back onto my feet and decided to take action. I didn't do it alone; the prophet was helped by a whale, and I had the help of the Muslim Youth Organization. They lifted me to the surface by teaching me the impact of my actions and giving me skills that I could use to help my community. They showed me that everyone has the capacity to change the world, but only if they are willing. Growing up I often struggled with connecting to my community. I complained about issues that occurred locally or globally but didn't do anything to change them. I ignored the world's problems and blamed others for not taking initiative. After the floods, I learned that change will not occur unless I advocate for it. I discovered that the key to making a difference is eagerness and willingness to change the world around you. Through reconnecting with my community I also connected with my grandfather's spiritual teachings. In the past, I had often disregarded his religious lessons, thinking that they were insignificant and pointless. However, after the Alberta floods, I reconnected with that part of my identity. I learned the true meaning of my grandfather's miraculous stories -- such as the one about Prophet Yunus -- and applied them to my daily life. My grandfather's words of wisdom still echo in my ear today, urging me to make a difference in the world around me. Now, whenever I am faced with trials in life, I simply remember the story of Prophet Yunus. The story reminds me that giving up is not the answer and gives me the power to carry on through any obstacle. Ameena Naqvi is 13 and in eighth grade at Arbour Lake School in Calgary, Canada. Her hobbies include drawing, playing the flute, and reading. She has a passion for music and writing.